Put eggs in a medium saucepan and add cold water to cover. Bring just to a boil over high heat. Remove saucepan from heat and cover tightly. Let stand for 12 minutes. Pour out hot water from saucepan and replace it with ice water. Let eggs stand until chilled, about 10 minutes. Crack eggs. Starting at larger end of each egg, and working under a thin stream of cold running water, remove shells. Cut each egg in half lengthwise and remove yolk. Using a rubber spatula, rub yolks through a sieve into a bowl. Stir in mayonnaise, 2 tbsp. horseradish, and cream and season with salt and pepper. Use a small spoon to stuff egg whites with filling. (For a professional look, transfer yolk mixture to a pastry bag fitted with a star tip. Pipe yolk mixture into whites.) Place on a serving platter, cover loosely with plastic wrap, and refrigerate until serving, up to 8 hours. 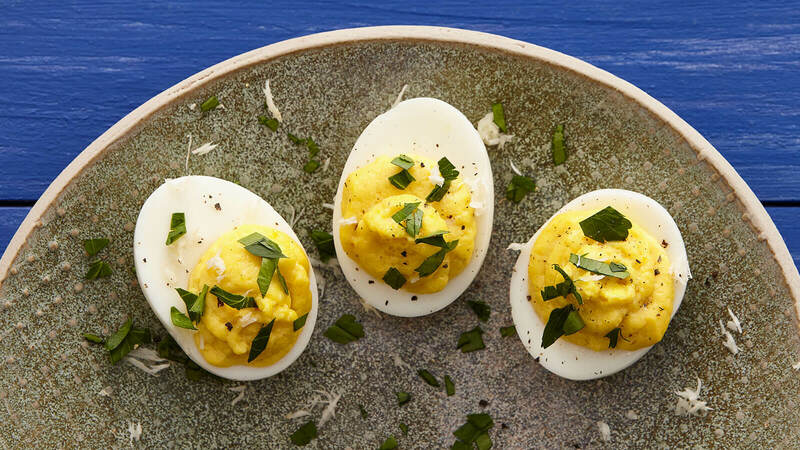 To serve, grate a little more horseradish on top of each egg and sprinkle with parsley, if using. Serve chilled. Horseradish: To prepare fresh horseradish, pare away the thick tan peel with a sharp knife and grate the white flesh with a Microplane zester with moderately large holes or the small holes of a box grater. Pour in enough cider vinegar or distilled white vinegar to cover the root. Refrigerated, horseradish root will keep this way for two months.